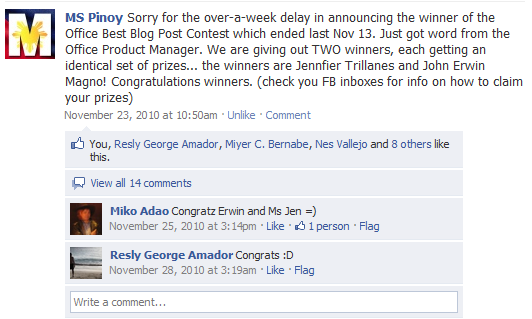 A contest from MS Pinoy Community Group which Jennifer and I won. Each of us got a Microsoft Office 2010 Jacket, Microsoft Office T-Shirt and Microsoft Office Messenger Bag. Thank you MS Pinoy and Office2010tayo. This entry was posted on Tuesday, November 23rd, 2010 at 4:33 pm	and posted in Contests. You can follow any responses to this entry through the RSS 2.0 feed.